Hoppy, farmhouse saison with champagne like effervescence; flavors include ginger, spice, orange and toasted grain. My cup runeth over. My label features little famers--Quaker looking folk--in a canoe raising their goblets to the new corn moon. Okay, maybe I'm confusing this beer with a Disney song. But this beauty simply soars. Pale sunset russet on the eye with creamy head buoyant enough to bear fair Aphrodite on its delicate foam. Champange on the nose, but something else too.....something stinky like a soft ripened cheese, but also heavily citrus. Teasingly effervescent with bubbles bursting like ripe muscat grapes on the palate. And then an unexpected aromatic twist--a faintly metallic tang. Light on the tongue, creamy, well done spices. A breathtaking achievement from Cooperstown. Please, Sir, may I have another? First pour in a challis. Mammoth head with tons of yeast, pepper and citrus on the nose which I can smell a foot away. Typically cloudy but lighter in color than some other beers in this style. Very complex. Flavors are all over the place. Savory heat (cilantro or watercress maybe) on the tongue and a bubbly tingle in the mouth. A grainy malt texture blends well with the yeastiness which lingers but doesn't overpower the palate. A superior taste with an even better sensation in the pie hole. Results from the second pour are almost the same. A little more heat as the beer has warmed up some. Final pour. I allowed some of the yeast to flow into the glass. I can still taste it after ten minutes. Not the way to go for me. I have tried this before with a 11.2 ounce Belgian blonde and it worked well. So it's the type of beer, temperature or some combination of the two. Overall I love this beer. It is my favorite saison and one of the best beers I have tried. Note* I'm not a fan of a big grapefruit presence (probably because I don't like grapefruit) so take this into consideration if you use opinions as a guide. Appearance: A slightly hazy gold, with carbonation still very visible through the haze. It poured with a beautiful 2 and a half finger head that retained very well throughout. Smell: Very clearly a Belgian. Lots of spice and flora on the nose, and very inviting. Taste: Delicious. A very well-balanced saison, combining the spiciness of the Belgian yeast with light citrus notes (mandarin oranges) and a nice dry finish. Fell: Very well-carbonated and easy to drink. The moderate ABV level is well-hidden by the complex yet approachable flavors presented in the beer. A delicious example of an American saison. Very easy to drink, yet still complex enough to provide you something to mull over if yo want to. I've been a little too intimidated to review this beer for some time. There is just no way an amateur like myself can do it any justice but I will do my best. It is simply spectacular. Appearances first: I love the fact that Hennepin comes with a champagne style cork in a 750 bottle. Like all of Ommegangs beers, it is fun to open but that is just the beginning. Hennepin pours a rich gold. Its sticky and its head lasts and lasts and lasts longer than just about any beer that I have ever seen. Its highly viscous, globular, and almost alive. When I tilt my snifter, my Cabernet/Bordeaux glass, or my goblet of Hennepin the head forms a brilliant lacey coating around the bottom of the glass. It doesnt dissipate. It just rests forming a different beautiful pattern each and every time I tilt. Furthermore, Hennepin has an intensity in its hue and brightness that is almost unrivaled. This is a beautiful beer. Onto the smell: Hennepin smells like I would imagine an idyllic Medieval farm to smell like: grain, straw, horses, sacks of dried flour, pepper, and of course, a beautiful lady. As tripe as this may sound, I assure you that Hennepin does indeed carry with it a quality that reminds me strongly of William Goldmans the princess bride. This beer smells like I would imagine Buttercups hair to smell, utterly perfect. Taste/Mouthfeel: Hennepin is medicinal, no doubt about that. Its taste is robust and ads vigor to the body. There are also most certainly elements of lemon and grass, freshly baked drop scones, honey, and biscuits. The finish is dry and nutty, leaving the mouth thirsty for more. It wraps and warms the tongue and coats the palate, stomach and esophagus. I cant get enough. This beer breaks the arguments of wine snobs down to detrital slime. Ommegang Hennepin Farmhouse Saison poured out into my tulip glass a cloudy/hazy bright golden hue. Atop sat a 2-finger white fluffy head that had good staying power and formed numerous collars of foam while consuming. Fine carbonation bubbles rushed to the top - champagne like. The nose is fruity, peppery and yeasty. The taste is of light fruit; orange peel, candy sugar, spicy and peppery. Mouth feel is creamy with fizzy carbonation that tickles the palate. The ale finishes a little dry. 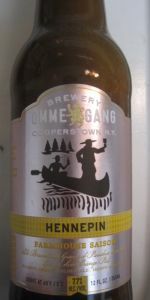 Hennepin is very drinkable and a fine brew from a top shelf brewer Ommegang. pours a slightly cloudy yellow with a big white head that holds fairly well with a light to medium lace. smells great, with herbs and spice and pepper and clove. very peppery taste, with lots of spice and clove. lots of crisp carbonation and medium mouthfeel. slightly sweet and dry also. just a great taste can't wait to get more. 25.4oz bottle purchased at Trader Joe's with the new labeling, poured into 6oz tulip glass. APPEARANCE: 50:50 fluid to head ratio. Beer is a rich, overcooked-olive-oil-yellow with aggressive effervescence. Fully translucent but cloudy. Head is pure white with subsidence in asymmetrical patterns, leaving pillows of foam in unpredictable places. TASTE: Tart to the tongue inducing pleasant saliva secretion. Hops are very present but just enough bitterness to balance the bright flavours. Yeasts are very fruity - Notes of citrus. Notes of anise root. notes of papaya. "aftertaste" strongly resembles pear jelly bellies. Alcohol is well concealed. MOUTH-FEEL: Frothy due to the easily-agitated carbonation. Tickle to the tongue, followed by a filling gulp down the throat. Viscosity of true fluid is low. OVERALL: This beer was rated without any financial bias, however, the pleasure it provided was frighteningly affordable. If I were to ever drink this with a buddy, we'd certainly need two bottles, because I'm not sharing mine. On tap at the House of Brews. Served in a snifter. Appearance - Hazy light golden body. Huge white head. Nice lacing. Thick collar and some surface wisps. Smell - Estery fruitiness. Some light banana and clove. Grainy. A bit of apple. Taste - Grainy and yeasty up front. Apple fruitiness builds. Some banana builds too. Slightly bitter yeasty finish. Mouthfeel - Medium body. Well carbonated. Overall - Solid saison. Not necessarily remarkable in any category, but very good overall. Light color with lots of carbonation bubbles. To me this has the scent of a Belgian Tripel, a bit funky with some spice. Quite a complex range of flavor, there's beery maltiness, some spice with a tripel yeast finish. It's flavorful and yet very much still a beer. Very carbonated and creamy. Well done. The slightest bit of heat on the end. A: Pours a slightly, hazy golden color with a very robust and creamy white head showing good retention and some lacing. S: Aromas of corn/grain initially with an evolving and increasing clove and lemon scent, as it warms. T: Very dry. Clove and hot pepper flavors mostly, maybe some citrus. Strong bitterness throughout. M: Light bodied with significant carbonation despite rather high ABV for style. Crisp finish. O: A nice representative of the Saison style. A little drier and more bitter than average, but with a more complex flavor profile and more refreshing than most. Look - Nearly clear, gold in color with a big fluffy white head. Lots of visible carbonation. Aroma - Coriander, slight hay, white pepper, orange, grass. Taste - Biscuity malt, bitter spice, grassy hops, pinch of orange, musty, clean dry finish. The slightest wimper of alcohol after the finish. Feel - Medium body, loads of carbonation, dry. Goes perfect with the taste and makes an incredibly refreshing beer. Overall - All of the flavors compliment each other extraordinarily well. One of the best beers I've ever had. Looks: Gold, with a head visible even through the bottle. Smell: Fruity, yeasty, and hoppy. Not the best, honestly. Taste: Much more subdued than the smell. A mild fruitiness and freshness without much hop bitterness until the aftertaste, not unlike a good pale lager. A little citrus. Extremely easy to drink. Mouthfeel: Thicker than I expected for such a pale beer, almost creamy. Overall: A very fine beer for a hot summer's day. The smell can be off-putting, but the beer is much more mild than it seems and it would be a good alternative to macrobrew lager. Look: The body is gold and has a one-finger head which quickly recedes to a thin layer of white foam. Smell: The nose offered notes of toned-down lemon juice. Expect no funky smell. Taste: The palate matches the nose right off the glass like many North American Saisons. Then, it shifts quickly to notes of Belgian spices which are milder than those found in the back-end of a witbier. As a result of that, Hennepin is not aggressive on our tongue and is very drinkable. Feel: Like any saison, be it from Belgium or North America, this beer is refreshing. Moreover, we do not feel a crispness that might blur the lines between a saison, a radler or a lemonade. This last detail is a plus. Overall: This beer is a simple textbook North American saison. Although it is stylistically anonymous because of its simple notes of lemon on the front-end, its simplicity actually makes its charm. The only reservation I have with Hennepin as well as other North American saisons has to do with the head retention. Sure, the beer has a nice lacings, but it can't match other Belgian saisons, which mostly manage to keep a half-a-finger head during a tasting session. Despite this flaw, I would drink this very often during summer. Billowing, egg-shell colour head standing nearly 3 fingers tall, reducing to a half finger with fantastic retention. Light lace common of the style. Copper/light yellow hue, bubbly carbonation. Light farmhouse funk on the nose; straw, must and light skunk, going hand in hand with banana, bread, bubblegum and spice. Orange peel, lemon rind, papaya, banana + peel, coconut, lemon candy, apple, pear, cracker, bread, Belgian yeast, pine, earth, clove, coriander, peppercorn, ginger. Floral and herby. Medium bodied, slightly astringent, earthy, crisp and refreshing. Would pair great with a proper meal. Exceptional saison, just needs that "it" factor. Bottle BB 1/20/17. DFH Tulip. A (5): Pours a slightly hazy light gold with three fingers of frothy, foamy, white head that seems to be lasting forever. Arguably the thickest, longest lasting head I have ever had on any beer, ever. Loads of carbonation streaming up from the sides and bottom of the glass. Lacing is exquisite. S (4): As soon as I popped the top, I could smell the Belgian phenolics: bubblegum, spice (not clove, but similar), yeast, green banana, candied orange peel (orange peel is really in there, go me!). T (4): Tricky and deceptive arrival; complex flavors that call you to attention immediately, but I wouldn’t call it bold – this is not Duvel; it is overwhelming and laid-back all at once; slightly malty and phenolic/spicy arrival, turns more phenolic and slightly medicinal on the mid palate (ginger? ); goes for a slight funk/dried straw note right at the end, and then bitters to a very smooth, lingering phenol, spice, and hop ending. As was the case with Duvel, I find the hop/clove/alcohol combination to be a bit much as this grows warmer, but it is a really well balanced beer. M (4.5): Lighter side of midweight, actively carbonated, but not biting. A little residual slickness, but clean and dry overall. O (4.5): I have seen this beer on the shelves for years and years, and wanted to try it. Now that Ommegang is releasing more things in six packs, I am able to try some of their wares, and I have been impressed with everything that I’ve had. This is excellent, and if I could afford to do so, I would drink this all summer long. 7.7%ABV? You would never guess. This is a deceptively complex yet simple beer; loads of flavor, but eminently refreshing. It reminds me a lot of Duvel, but that, I felt, was overpowering; this is not. And is this ever a beauty to look at and to nose. I’ve only had two other Saisons: the first one I don’t really remember, the second I remember because it was awful. I suppose in this case, the third time was the charm. Realistically one of the best beers on the market today when tallying in so many different factors. Deserving of a 5 across the board. Translucent yellow allows a nice glare to lighten the contents in the glass. Colossal head frothy, creamy, and sticky. Excellent texture. It not only hangs on to the end, it wonderfully finishes the great story that this beer is. Fruity and floral aromas; detected a slight hint of banana and or grassy tones. Very complex body, very complex beer. At times fuller and chunky, at other times lighter and somewhat sweet. To call it excellent is an understatement. One of the best beers I have ever had. Pours with a cloudy, flaxen color much like a hefeweizen. This is the perfect beer for...let's see...just about any day. Summer is best I suppose, as it has a crisp, sweet, clovish flavor that lends itself to a barbecue. The carbonation level is just about right. This beer does not encumber itself with a variety of complex flavors but instead goes right for the jugular, offering a crisp, clean taste. Poured from the 22 oz bottle, into slim tulip glass. Appeared a light, cloudy golden yellow. A nice thick head formed, and lasted almost all the way down the glass. Smell was a nice, refreshing aroma. This smells likes it going to be a nice, refreshing beer. A little fruit, maybe a little citrus, more like an apple orchard. Some bready notes as well. Tastes great! Some hops, with a little bite. With a nice malty sweetness. I really like this beer, and is my wife's favorite, so I always have some in the house. This is a wonderful beer! A - Pours out clear golden in color. Carbonation is champagne like and constant. The head is two fingers of white foam. Retention is good but lacing is a moderate. S - The nose is excellent. Lost's of clove and black pepper spice. Belgium yeast, banana and faint wheat characters thought the middle. Sweet white grape as well. Hints of alcohol. Complex. T - Yeasty, spicy, grainy, fruity, it just like it smells. It taste so damn natural. M - Smooth and refreshing with a champagne like finish. Pretty damn good. O - Pretty much outstanding. Lots of flavors going on and melded so well together. Excellent to say the least. i poured the first half of this gem slowly. poured beautifully in my glass with about a half inch of head that stayed the whole way. excellent carbonation the entire time. wonderful bouquet of hops, fruit, and citrus smells. taste is truly a belgian spin. wonderful finish to the palate. the second half poured the same but slightly cloudy from rousting a little of the yeast. excellent. suckem up and movem out. Look - Resembles a sparkling champagne, golden and lightly carbonated. Full, foamy head. Smell - Hops and citrus, can definitely smell the coriander and ginger and hops. Taste - Refreshing and tart with citrus overtones. Mouthfeel - Very drinkable, another stomach warmer, another one that's hard to tell it is such high alcohol content, which is a good thing. Overall - Amazing brew, seems like a Summer beer but it was hearty enough to also enjoy in the Winter. Another solid brew from Ommegang!